After Bridal Couture Week held in Karachi and Lahore, Pakistani designers are now set to showcase their bridal collection on an international platform like Bridal Asia 2011. 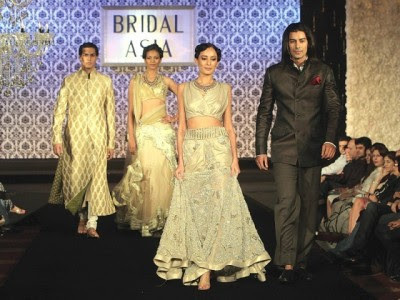 The three-day wedding extravaganza Bridal Asia, know as a one-stop destination for brides and grooms, will start in New Delhi on September 30. “Apparel, jewellery, sterling silver, lingerie, linen and accessories, the event will offer the finest collection of every conceivable article for the bride and the groom,” said Divya Gurwara, CEO Bridal Asia. “The event will be put together by the topnotch names in bridal finery from the Asian subcontinent,” she said. Marking its 13th year, Bridal Asia has approached leading designers from India and neighbouring counties to showcase their design aesthetics. Indian designers like Tarun Tahiliani, Raghuvendra Rathore, Pallavi Jaikishan, Bhairavi Jhaikishan, Falguni and Shane Peacock and Sabyasachi Mukherjee will participate. Honey Waqar and Jannat Shahid from Pakistan have been confirmed to showcase their creations. Bridal Asia started for the first time in 1999, showcasing a blend of modern and traditional, classical and contemporary collections at affordable prices.